In this post I expand on using records. This time creating a record array that contains a character string, or more specifically two character strings. Action! won’t allow you to add a CHAR ARRAY as part of a record (TYPE) definition. You can get around this limitation by using BYTE POINTERS. You place the string as the last variable in the TYPE definition, but as a BYTE declaration. To include multiple string variables, a series of bytes must be added to “reserve” space for the first string. For the tContact TYPE below, bFNm is first name, bLNm is last name, and bR1 through bR10 are the “reserve” bytes. None of these will be referenced via the record.field syntax, though you could for types other than CHAR ARRAY. Suppose you have a BYTE ARRAY name bArray for storage space, a BYTE POINTER named bpFirst for first name, and bpLast for last name. 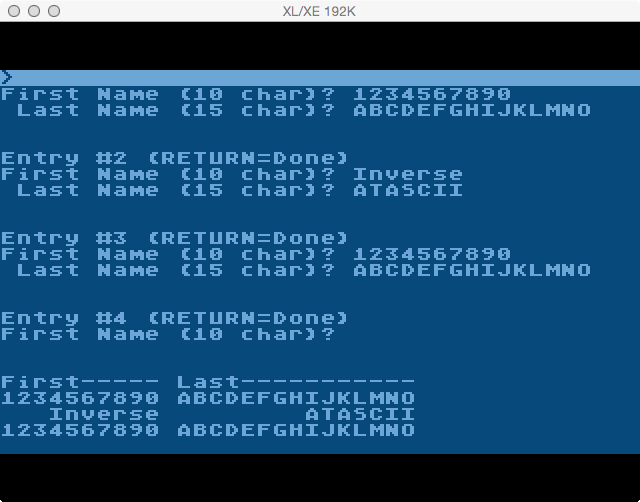 The first name is 10 bytes (11 with size), and last name is 15 bytes (16 with size). The last name offset into the record is therefore 11. The size of the entire record (first name and last name) is 27 bytes. First Name Record 1 will be stored at 0 offset into the storage array. Record 2 will be stored at 0+(1*RecordSize) into the storage array. Record 3 will be stored at 0+(2*RecordSize) into the storage array, etc. 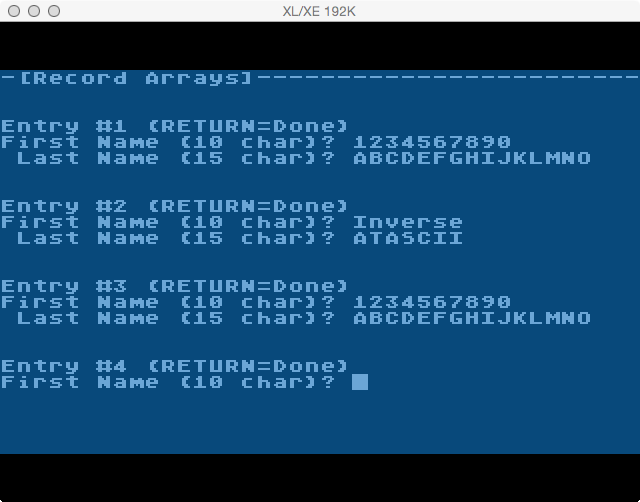 Last Name Record 1 will be stored at 0+FirstNameSize offset into the storage array (11 bytes). Record 2 will be stored at 0+(1*RecordSize)+FirstNameSize offset into the storage array. Record 3 will be stored at 0+(2*RecordSize)+FirstNameSize into the storage array, etc. ; 0 based counter computes.